Home Expert Advice Skincare Advice Eye Care What Causes Dark Circles? 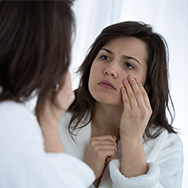 Dark undereye circles are one of the most common skin concerns. If you’re struggling with them, you’ve likely wondered “why me?” We know the feeling, and it got us to research just what causes dark circles. As it turns out, many things cause or contribute to dark circles under the eyes—some of them may surprise you! Sun damage from years of unprotected sun exposure (tanning indoors or out is the worst) leads to excess pigmentation showing through the thin skin underneath the eyes. Blood flow showing through the thin skin around the eye, sometimes referred to as vascular dark circles. Using harsh or skin-aggravating ingredients—including fragrance—around the eye area. Inherited traits, where there’s a family tendency to have dark circles around the eyes or just under the eye area. Natural shadows, resulting from having deep-set eyes. Shadowing from sagging skin and lost facial volume. Buildup of dry, dehydrated skin around the eyes, causing dullness and a loss of radiance. A habit of rubbing skin around the eyes, which steadily damages delicate eye-area skin. Surprisingly, lack of sleep is not a cause of dark circles—but failing to get sufficient sleep makes existing darkness look worse, as many of us know all too well. Skincare, even the best or most expensive eye creams, and in-office procedures won’t completely eliminate dark circles, so learning how to conceal them is a must to achieve more even-toned skin around the eyes. And, to the surprise of some, daily sun protection is critical to keeping this lesser-known cause of dark circles from continuing to make them worse. Now that you know the causes of dark circles, learn what you can do to target their appearance, with an eye cream for dark circles or other skincare helpers, and methods that only a dermatologist can use to remove dark circles, including vascular dark circles that skincare products—even really expensive ones—cannot improve.